Memories of Columbine and other infamous school shootings are never far from the minds of parents of school-age children. So when the above ad for the video game, “Medal of Honor” went up on a billboard across the street from a Westchester elementary school, many parents there reacted with dismay. One of those parents, Denise Gustafson, whose daughter attends the WISH charter elementary school, said she understands the company’s legal right to display the ad, but wants it to show sensitivity to parents who are concerned with their childrens’ exposure to violent imagery, especially when they can see it every day from their school grounds. “I think it’s about time parents and citizens alike begin thinking about the negative impact these images have on our children and our beautiful City of Los Angeles,” she said. New York-based Van Wagner Communications is a member of the Outdoor Advertising Association of America, which has a code of practices with a section titled, “Protect the Children.” In that section is a provision calling for an “exclusionary zone” prohibiting ads for products illegal for sale to minors at least 500 ft. from elementary and secondary schools, public playgrounds, and established places of worship. A 2005 law in California bans the sale of violent video games to minors, but legal challenges have carried it all the way to the U.S. Supreme Court, where justices just yesterday heard oral arguments in the case. 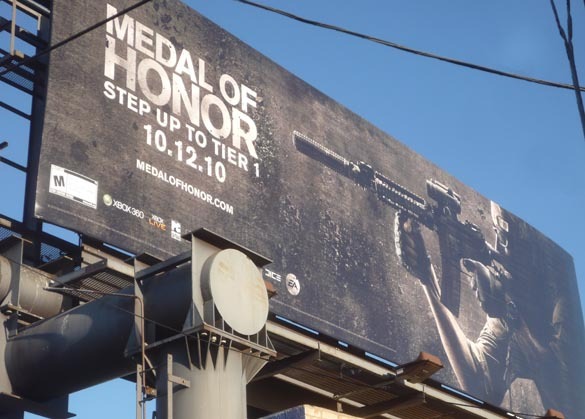 The “Medal of Honor” game advertised on the billboard is set in Afghanistan, and features various forms of shooting and mayhem. The game has sparked controversy in some quarters because players have the option of assuming identities as Taliban fighters, who are ostensibly trying to kill U.S. soldiers and commit acts of terrorism.